I needed a reprieve from election coverage, so I decided to watch old Simpsons DVDs tonight. I picked the seventh season and ended up watching the episode “Two Bad Neighbors,” in which George and Barbara Bush move across the street from the Simpson family. Things do not go well. At one point, Bart and Homer get George to step out of his house by tricking him into thinking that his sons — “George Bush Jr. and Jeb Bush,” as Homer puts it — are coming to see him. 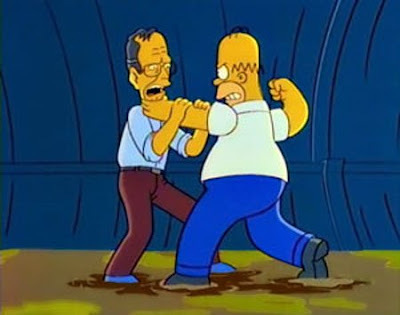 Odd to watch tonight, of all nights, because I’m now positive that this episode, which aired January 14, 1996, marked my first ever awareness of George W. Bush. Being reminded of that tonight seems just a little significant.